Once experimented with REST technology and with the “Bridge” communication mode, we can introduce a project that achieves something difficult so far with an Arduino board: writing a web page, to be run by Linino’s internal web server uHttpd, to manage the pins of Arduino with REST, but via a web page. We will show you this and more: we also want our website to be updated both when we perform some direct action or when something happens on the Arduino side to show you a template for any given sensor measuring or actuation page. This project will show the differences between a microcontroller system – typically mono-program – and an embedded system equipped with an operating system as GNU/Linux. 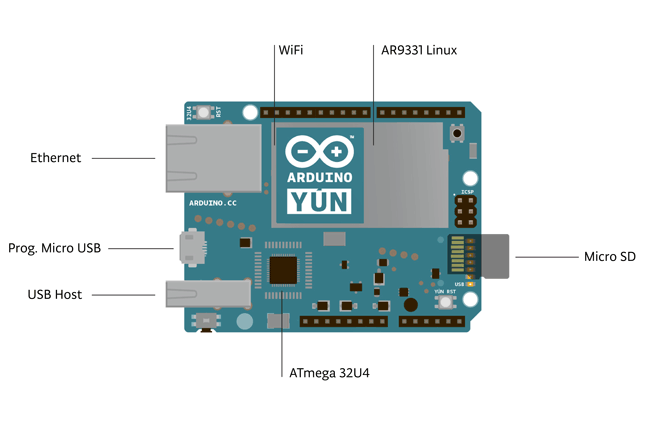 The Arduino Yun board incorporates both “souls ” with a good bridge solution to integrate them. We want to create a web page that allows us to control the sensors of the shield and, simultaneously, to receive the notifications of the changes that take place on the Arduino section of the board. present in the Micro SD Card. Hence the web pages are on the micro SD, they do not take up nand memory space and, a precious memory space dedicated to the sketch. or nothing if the page is called “index.htm”. In the bottom of the page we have included a field where are the messages that the programs activated with Ajax technology send back, very useful for the execution of the tests. Let’s face the problem step by step. 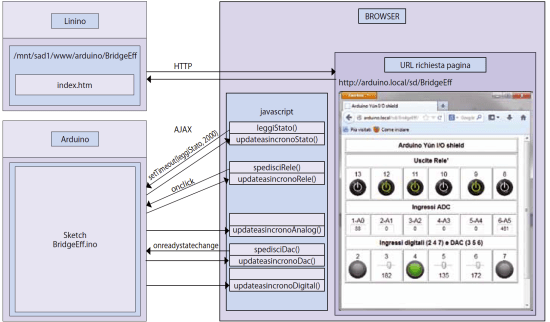 Start to analyze the AJAX mechanism related to the button that changes the status of the relay 13. The “sendRelay” function insert the waiting message in the text box “description” at the bottom of the page, which shows messages of communication between the AJAX “actors”, then instantiates a request to the web server, against which books the execution of the function “updateasincronoRele” that will be activated when a reply from the server will be received. Finally it makes the call to the server with GET method. The null string in the send method is required by the fact that we performed the call with the GET method. The server usually answers quickly and very rarely you will see the message — Wait — , unless there are problems. Once got a valid response message, function “updateasincronoRele()” (“updateasynchronousRelay()”) is activated: if there are no errors – i.e. the response status is equal to “4” and the status of the request is equal to “200” – it intercepts the return message, composed by fields separated by commas (we will build it by changing the sketch of the Arduino side, as we will soon see). The function updateasincronoRele() first “unpacks” the message in an array and then extracts the single fields in significant variables for each type of message. In the case of relays, it updates the values ​​in the fields PinAct and Image with the values ​​received in return. If the status of the relay is deactivated (Variable PinStatus = 0) we have to see that, next time you’ll click on the appropriate button, the relay will be activated , then we will set to “1” the value of the hidden field (type=hidden) “action” corresponding to the relay in reference, for example “action13” . Similarly we set the image corresponding to the status of the relay. Actually we set only the name of the .gif image that we want to be shown. This will then be taken directly from the browser that requests it directly to the web server. We put the images in the same folder where is the HTML page (/mnt/sda1/arduino/www). The final instructions physically changes the objects “actionx” and the source of the image “imagex” where “x” is the pin number reported to the relay on modification. Then it returns back the entire message in the field “description”. You can also delete this information writing ” ” in the field or whatever you prefer. As you will notice, during all this work, the page is never updated, but remains in place. Let’s see the code snippet that creates the cell in the grid on the web page that controls the PWM pin number “3”. We named the pin with the name (id) “pin3” to which we associate the value “3”: this value will be sent to the server in the AJAX call. The real “slider” is described in the tag “input” with “type = range”. The specifications of the slider are the value “min”, which is what takes the slider with the slider all the way to the left, the value “max “, slider all the way to the right, and the “step ” or increase, which sets the change in value corresponding to a unit shift of the cursor. To change the position of the slide, and thus the associated value, use the mouse, click on the slide, drag to the new position and release. Upon release of the mouse the event “onchange” is activated, event that recalls the function “spedisciDac” (“sendDac”) passing the value of the field “pin3” (contains “3”) and the value set by the slider “this.value”. The first two instructions of the function “spedisciDac()”(“sendDac()”) set the field “ValoreDac3” (“ValueDac3”) with the past value in order to give visual evidence of the value set, in the text field below the slider. Then the URI REST is sent to the server, as in the case of the relay and, after the response has been received, the values ​of the slider and of the text field are re-updated, as you can see in the code. Anyway, why, given that it is a analog output pin the return value can only be equal to the starting value? For several reasons. First: from the beginning we decided to build an interactive page, which was updated without need to recharge it every time, and thus requires mechanisms to update the values of the objects without human intervention, as we shall see shortly. Second, the DAC value of the pin may be modified, without our knowledge, by a function of the sketch and then we need to devise a mechanism to be notified. For both feature the mechanism is the same. We need to see that the content of the page is updated autonomously, so as to present the real status of the sensors of Arduino and of the peripherals connected to it, in our case the shield. This function in turn calls CaricaStatoPin(), which makes the AJAX call to update the values ​​of all the pins. Looking inside the code, we see two peculiarity compared to what we have described until now. where each KEY = VALUE pair is separated by a “#” character and within each couple the KEY is separated from its value by an “=”. The value ” 99″ has been added to respect the REST formalism. Actually its not really needed, but the whole chain expects a value in this position. We see the management of the update message of all the states in the script “updateasincronoStato”. This example will be useful all the time you’ll want to manage a REST message composed of several pairs of data KEY=VALUE. When we receive the message, need to unpack it in the original pairs KEY, VALUE and then treat each pair according to the type of pin that represents. With this long description you should be able to understand the rest of Listing 1 that creates the HTML page of our project. Now is time to create the Arduino sketch so that it responds with the messages that we expect. To create the sketch for Arduino, which must read and drive the pins on the card and talk with our web page, we have chosen to use as basis the example sketch called “Bridge”, that we’ll change to do so to respond coherently to the requests from the web page. 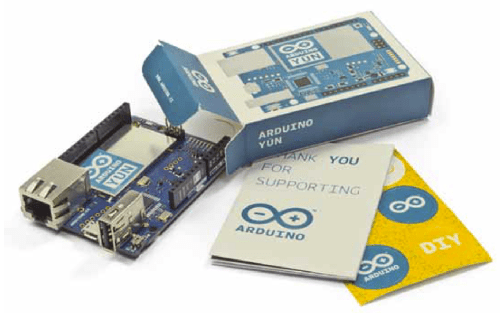 The Bridge library allows to activate the bridge between the Arduino sketch and Linino. The library YúnServer allows to activate the server on the Arduino side on the port “5555”, where the web server uHttpd of Linino re-routes the messages addressed to the folder “/arduino”, as the URI REST, in our case. Finally, the library YúnClient allows to accept and process messages from the server re-routed by the uHttpd server. with the name of the folder of the sketch. The page is opened and, at the bottom, we see that begins to flash messages to update the status of the single pins. Approximately every two seconds, the values ​​of all pins are updated with the values ​​provided by the Arduino sketch. Click on the buttons representing the relays and move some sliders. Move the position of the physical button and hold down the button. To see the changes of the status of the button we have to keep it pressed for a few seconds, the average time to update the page. We observe also the behavior of the page when we modify the value of potentiometer resistance, rotating the pivot. The variation on the page of the values associated with the last three inputs confirm that the page is automatically refreshed. Now try to connect to the same address in the same time with another browser window, a smartphone or a tablet, in more than one person and argue about who drives the pin and the slider. Move the switch and press the button and you will see all the browsers updated every two seconds. Try to change the timing of the upgrade until you find the best for you. Try to provoke conflicts and adapt the page and the sketch to your needs. By switching off Arduino Yun leaving the browser open, the word “— Wait —” will let you know that something is wrong. When you’ll turn it back on you will see the status of the pins comes back and updates. Nothing bad, isn’t it? How? can you explain or show as uno don’t have SD slot. Hey there, trying to set up a similar system, but my XMLHttp request isn’t working. Any advise? I can get to the device by putting the IP address and then the appenders in my browser, but when I try to incorporate that into a webpage, it’s a no-go. Please help! Are you using this example? Our code? Thanks for the informative and great article. Why i cant see the slider / images ? Also buttons are not functioning , any idea? Thanks Boris. When copying and pasting the code, I get that long list of errors. All of the single and double quotation marks that you used are unrecognized by the IDE and I had to replace them to compile. Also, the html file calls on jpegs that are not included here. Is there a github link with any of these resources to avoid simple things like incorrect font pasting? Also interested in this. Keep us posted! By chance were you able to create a GitHub repository containing the files needed to try the example? good idea but your software not work. can you debug the IDE ? Hi Boris, very interesting. However I have the same error of the macro “F” someone already pointed out. Could you put the arduino code on github? thanks in advance! I get ISO C++ forbids comparison between pointer and integer [-fpermissive]. Any suggestions would be greatly appreciated! Thanks and Thanks for the great tutorial!! Did you get a github link? Grazie! È davvero ben fatto! does anyone have a working sketch i can check out ?